From hearing aids to personal sound amplifiers, our audiologists offer a number of different treatment options to help patients maintain full and active lives. The ability to fit and tune a listening device for a patient’s particular need calls for advanced technology and patient-centered care. We understand the disruption hearing loss causes in your life. Most Americans wait 5 to 7 years before they take action to address their hearing loss. Fear of the unknown, lack of information about technology, and inaccurate stereotypes against hearing aids can stop many people from seeking help. It may not be easy to confront the fact that you or a loved one may be hard of hearing. Luckily for your treatment and recovery, our team of audiologists work to help you make sense of it all. Our multidisciplinary approach to patient care leverages the skillsets of all the physicians, doctors, and audiologists at Ear, Nose and Throat Associates – giving you a more complete care. The ability to fit and tune a listening device for a patient’s particular need calls for advanced technology, but, more importantly, a high level of patience. Our leading audiologists understand that and are “tough on the problem – but gentle on the person.” We take pride in working with doctors who address the physical and emotional needs of their patients. Expect highly qualified staff with a caring approach along with highly customized care. We understand that your needs are unique and that each story deserves to be heard. Our approach is patient-centered, and unique to every individual who walks in through our doors. We take pride in being gentle on the person and tough on the problem. We believe in making clients for life. It is this deep understanding of the patient experience that allows us to offer premium service through patient follow-up, education, and exploration of options. We encourage each patient to find the right solution based on budget, health needs, and latest technology available. Modern technology has made heavy, bulky hearing aids a thing of the past. Today, hearing aids are almost invisible and even rechargeable, so you need never fiddle with tiny batteries. 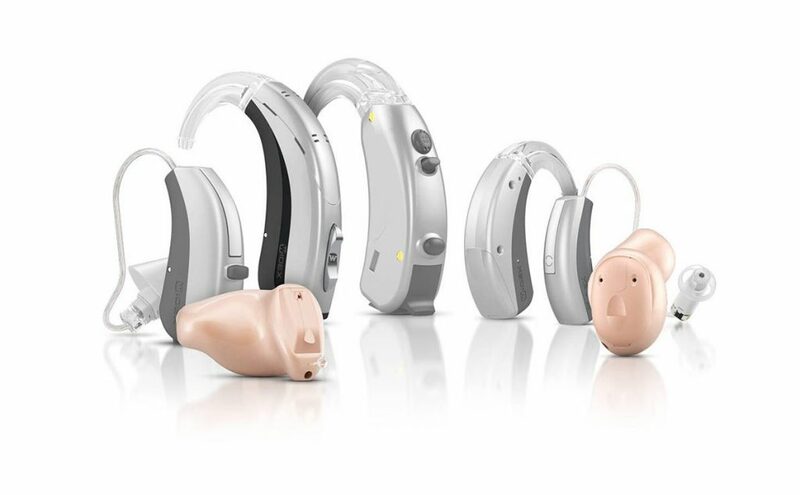 Our audiologists will show you a variety of hearing aids and listening assistive devices that can even connect to the digital world using Bluetooth wireless technology. At the Hearing Center at Ear, Nose and Throat Associates we match patients with the hearing aid solution that is right for their budget and lifestyle. If you or your loved one have been told “you are a candidate for hearing aids,” we recommend you come into the office together. Research consistently shows that patients have a higher likelihood of success when they bring a wife, husband, daughter, son, or close friend into the hearing screening. Have questions or are ready to book now? Schedule an appointment with your local Ear, Nose and Throat Associates audiologist today!